Locavores, rejoice. After an interminable wait, spring’s signature produce has finally arrived. Cue major farmers market kvelling over Saturday's visit to Abingdon Square Greenmarket, where ramps, fiddlehead ferns, rhubarb, grape tomatoes, and the king of them all, asparagus, were brightly displayed in ravishing novelty. It’s even the season for eggs—fowl egg-laying is triggered by lengthening daylight come Spring. 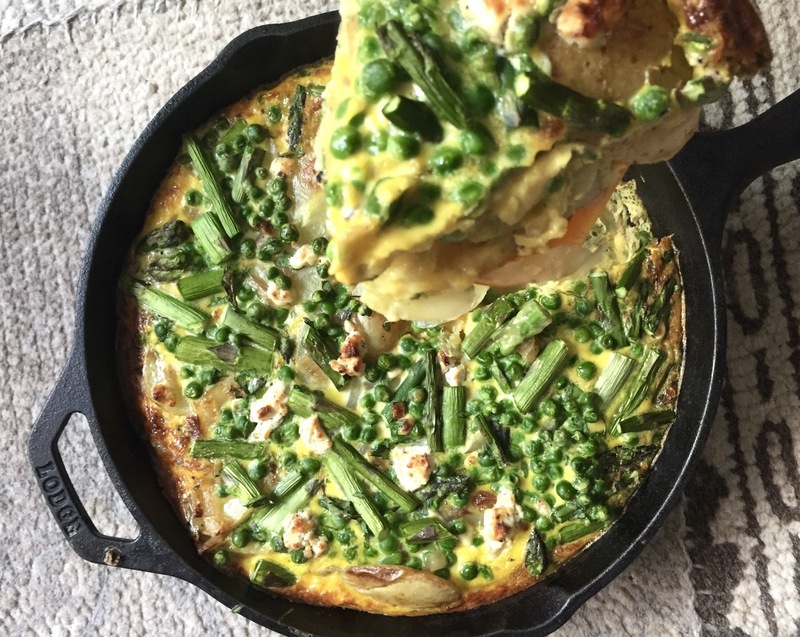 Cup of Jo—one of my favorite lifestyle blogs —is conducting a recipe series this month featuring the best of seasonal produce, so I tackled their very first featured recipe: Asparagus, Pea and Goat Cheese Frittata. Normally, I shirk away from frittatas, as this egg preparation tends to be a saturated fat surfeit that's way too rich for my palate. Indeed, the original recipe called for plenteous amounts of oil, butter, and heavy cream in addition to fat-rich eggs and goat cheese. But I was not to be deterred! 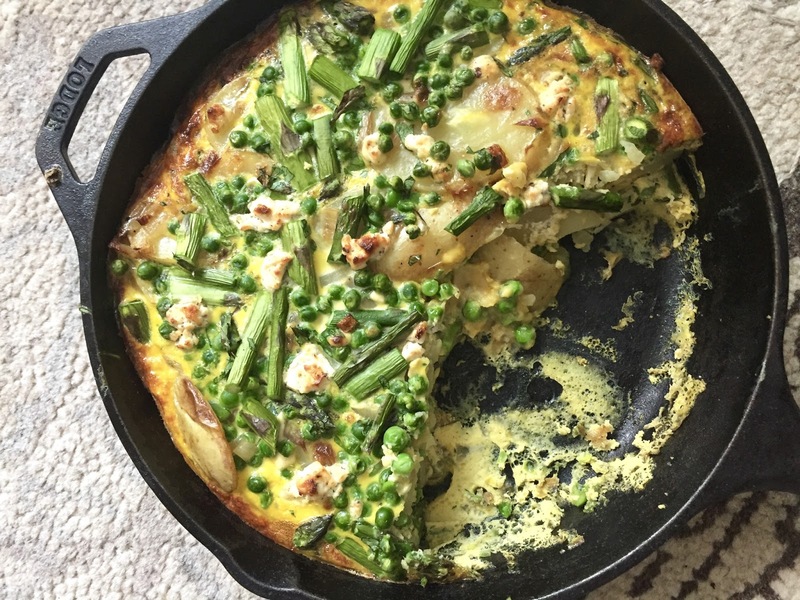 I eliminated (most) of these extra fat sources and added a healthy dosage of asparagus for a result that was spot on spring-lite: fresh veggies stole the spotlight instead of being overshadowed by their artery-clogging peers, with a tinge of buttery goat cheese folded into the fluffy eggs for a wholesome finish. 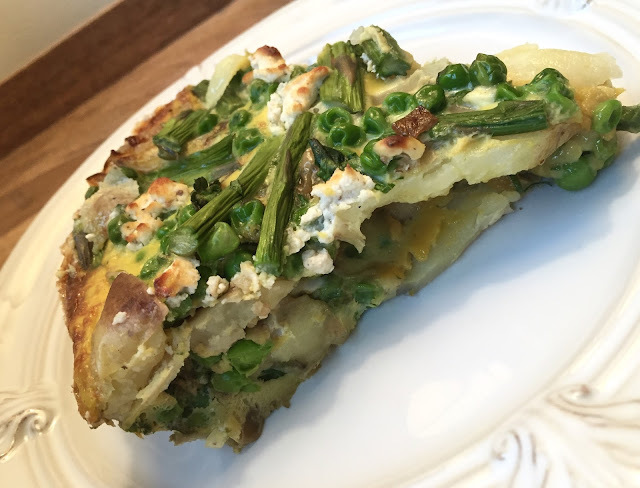 You could even call this frittata a veggie-spiked Spanish omelet, as layers of potato are an instrumental addition to the veggies, cheese, and egg. Stacked in classic Spanish tortilla style, the sweet, buttery potatoes add true substance to the dish—you don't even need a slice of toast on the side for that carb fix. It also makes the frittata extremely versatile for any meal. While I ate it two days in a row for breakfast, it made a satisfying dinner the next few nights as well (and kept, in the fridge, like a gem). Cooking time may vary: I shaved off about 10 minutes on the potatoes and forwent letting them cool, but noticed my eggs needed a bit more than the allotted 35-40 minutes to cook (stick a knife in the center and when it emerges cleanly, you are good to go). 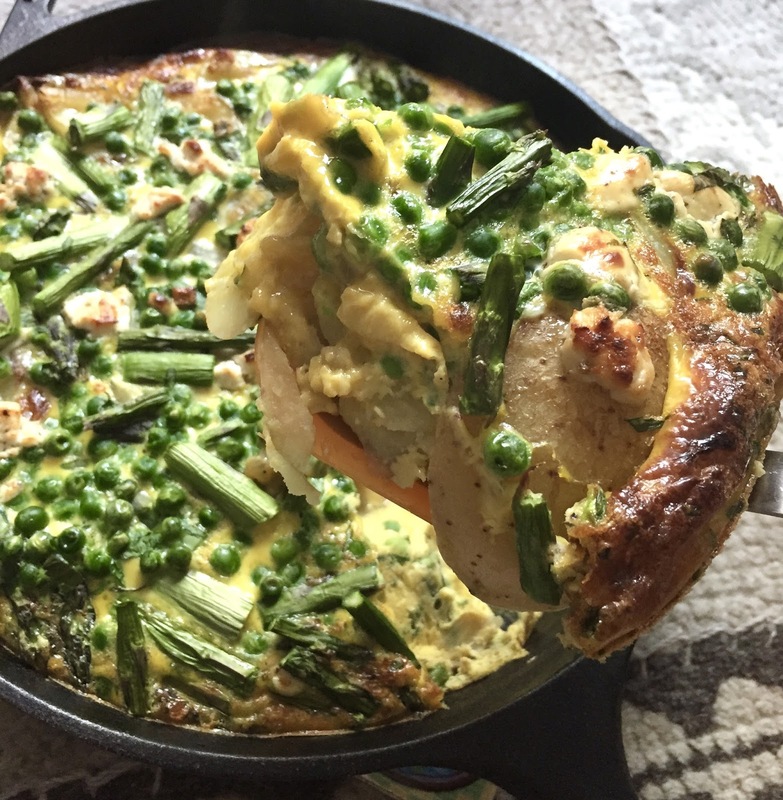 I acknowledge that this recipe is a time commitment, and other egg preparations could be completed with the same ingredients in a fraction of the time. But I promise: when you cut into that first slice of beautifully layered potato and egg pie, it is so worth it. 1. Place a rack in the middle of the oven and preheat to 400F. Line a rimmed baking sheet with foil and set aside. 2.In a medium sauté pan set over medium heat, heat 1 tablespoon oil. Add the onions and cook, stirring, for 6 minutes, until translucent and just starting to brown. Add 3 tablespoons of water and cook for about 4 minutes, scraping up any brown bits from the bottom of the pan, until the water evaporates and the onions take on a uniform brown color. 3,Transfer the onions to the prepared roasting pan. Add the potato slices and toss well. Add 1 tablespoon of oil and season generously with salt and pepper. Toss with tongs. Cover the pan with foil. 4. Bake until the potatoes are tender, 25 to 30 minutes. Let cool for 15 minutes. Reduce the oven temperature to 350F. 5. In a large bowl, whisk together the eggs, parsley and milk. 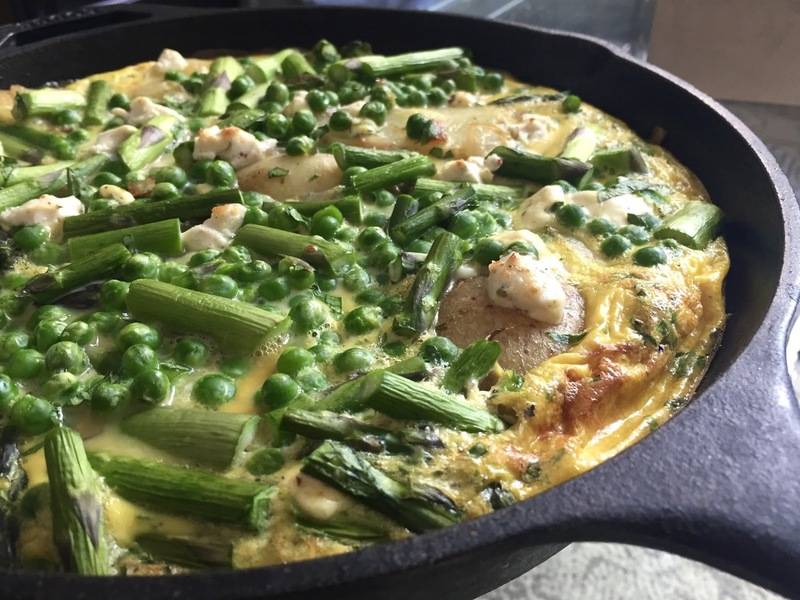 Stir in the peas, asparagus, and half of the goat cheese. Season with salt and pepper. 6. Coat a 10-inch cast-iron skillet set over medium-high heat with cooking spray or an additional tablespoon of oil. Add half of the cooked potatoes and goat cheese to the pan. Top with half of the egg mixture, spreading the veggies as evenly as possible across the pan. Add the remaining potatoes, followed by the remaining egg mixture, again spreading the remaining peas, asparagus and goat cheese across the tortilla. Cover with foil. 7. Bake for 30 minutes. Remove the foil and bake for 5 to 10 more minutes, until the tortilla is slightly browned and lightly puffed. Slice and serve directly from the skillet, warm or at room temperature.